You may be overlooking one of your project’s most powerful weapons for getting people to change their behavior. It’s Reinforcement of desired new behaviors. 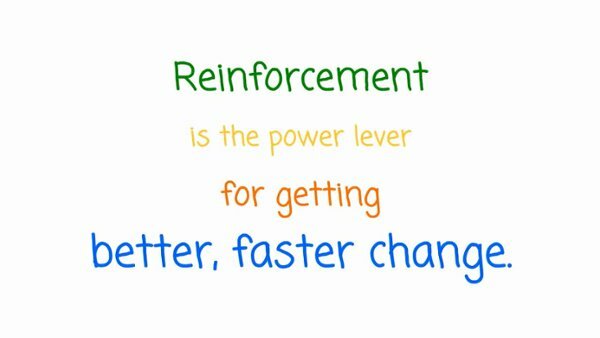 In fact, we would go as far as to say that Reinforcement is the power lever for getting sustained adoption for your change. Here’s why we say that: There is a fundamental principle of human behavior that says, “People follow the Reinforcement.” Which means that attempts at process change follows Reinforcement, too. That's why Don Harrison, President and founder of IMA, teaches in our Change Management Training programs that "every time you see a behavior, there either is or was a reward for it." In other words, no behavior occurs in isolation of Reinforcement. So if you want people to change what they are doing, you have to alter the reinforcements! As experts in managing change in the workplace, we know you can't expect people to be motivated to make the leap to the unknown unless there is a strong motivation to do things in the new way. People will change their behavior more quickly when there are positive rewards for the desired behavior, balanced with negative consequences for failing to change. But keep in mind you need to build in many more positive rewards than negative consequences to drive the migration of new behaviors. Why? Because people tend to focus on the negative much more than on the positive. Most people have experienced a situation where there was lots of positive feedback for some work effort, and just a single negative comment. But what sticks in our heads? Of course, that one negative comment! In fact, research has shown that there is a 4:1 ratio between positive and negative Reinforcement. It takes four positive Reinforcement events to equal just one negative. So even when a manager feels like he or she is over-doing the positive rewards, the employee perceives the number of positive rewards much differently! By following the below four key principles of Reinforcement from the Accelerating Implementation Methodology (AIM), and by applying them tactically throughout your project on an ongoing basis, Change Agents will be much more likely to motivate individuals to change their behavior. Ultimately this leads directly to getting better, faster project results. Reinforcement Needs to be from the Frame of Reference of the Individual. For any Reinforcement to impact behavior, it must have meaning or value for the individual you are trying to motivate. 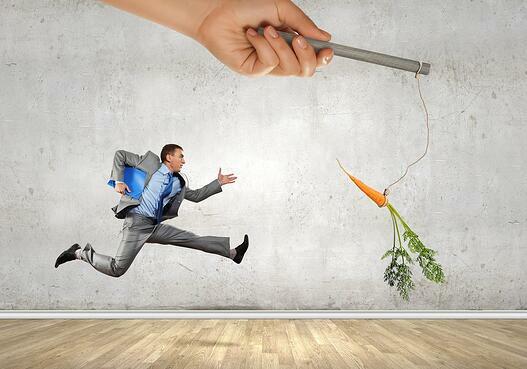 Remember, you probably won't find a single Reinforcement that motivates everyone! Reinforcements have to be applied as soon as possible following the behavior, and must be directly connected to that behavior. For example, you can’t wait for the annual performance review as the method for Reinforcement; the timing is just too infrequent. Employees must perceive there will be a higher likelihood of positive consequences for at least attempting to achieve results, versus negative consequences for making mistakes. However, you do need a mix of both! A menu of Reinforcements needs to be developed and applied. The AIM Targeted Reinforcement Index Change Management Tool is a great resource to help your Sponsors and Change Agents identify which specific rewards will be meaningful for the Targets of your change. Most people know it makes good sense to stop smoking, stop drinking or lose weight. So, why don’t people do it? Or in the business world, why do people refuse to use a new technology, or a different process even when they know their organization put a lot of time and money into the project? Unfortunately, it just isn’t that easy. People might know a change makes sense, or is better for them in some way, but without the use of Reinforcement, there simply will not be behavior change. And if you don’t get behavior change, you will never get optimized results!